San Antonio Spurs forward Kawhi Leonard was selected the NBA Finals MVP after his team won the title in five games over the defending champion Miami Heat. Leonard became the second youngest player to ever win the series MVP (Magic Johnson is the youngest). Considering that Leonard was not one of the Spurs’ Big Three of Tim Duncan, Tony Parker or Manu Ginobli, his MVP honor was a surprise… and probably not predicted by any basketball pundit prior to the start of the series. 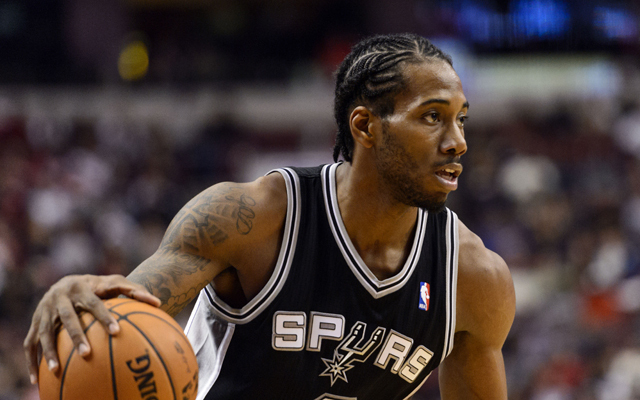 Leonard averaged only 12.8 points per games in the regular season for the Spurs, which was third-best on the team behind Parker and Duncan. His 12.8 pts/game average in the regular season is now the third lowest of a player who won the NBA Finals MVP that same season. The lowest was in 1978 when Washington Bullets center Wes Unseld won the ’78 NBA Finals MVP after only scoring 7.6 points per game in the regular season that year. Of the 46 players who have been selected NBA Finals MVP since the award was first instituted in 1969, 30 of them averaged 20 or more points in the regular season that year. Here’s a look at the NBA Finals MVPs who averaged less than 20 points in the regular season in the season they won the finals award.